I'm sorry to say this, but A Letter From Death Row is, unfortunately, awful. Michael Raine (Michaels) is accused of killing his girlfriend and is put on death row. He starts to think about how he can save his life. This movie is a nightmare to watch. Michaels can't direct or edit at all. There's one scene in the beginning where he does karate moves in front of a mirror and all these color effects and strobe lights start killing your sense of vision. Let's talk about his acting skills: Why? Charlie (Or Charles as he liked to called during 1997-1999) and Martin Sheen drop by to light their dignity on fire. Michaels made another movie in 1998: No Code Of Conduct. It's a million times better than this. 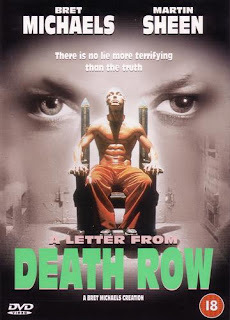 I think all copies of "A Letter From Death Row" should be executed immediately. I heard about this movie in an episode of Yes, Dear. I honestly had no idea it actually existed. Really? That's an odd reference for Yes, Dear to make. Unfortunately the movie does exist.